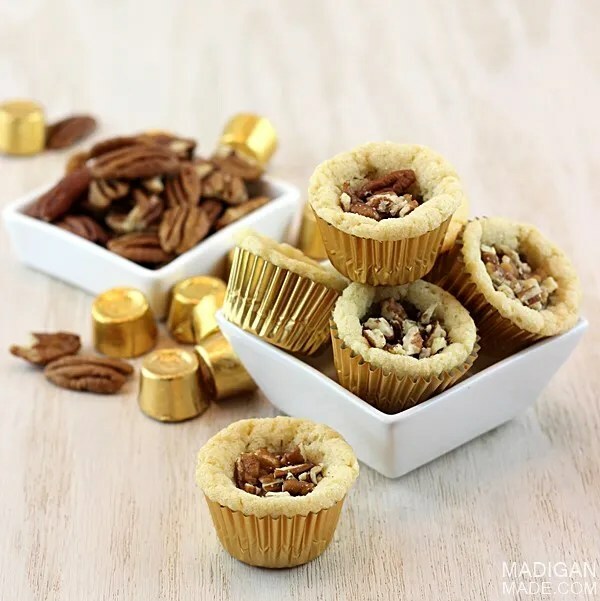 Madigan made… chocolate, caramel and pecan cookie cupcakes. Chocolate and caramel. It’s a combo that’s hard to hate, right? Add a few pecans and a little sugar cookie dough… and it’s a combo that VERY hard to resist! I’ve always been brainstorming about ways to create variations on our favorite cookie: the peanut butter cookie cup. If you remember, last year my pumpkin patch cookie cups used sugar cookie dough and chocolate kisses. 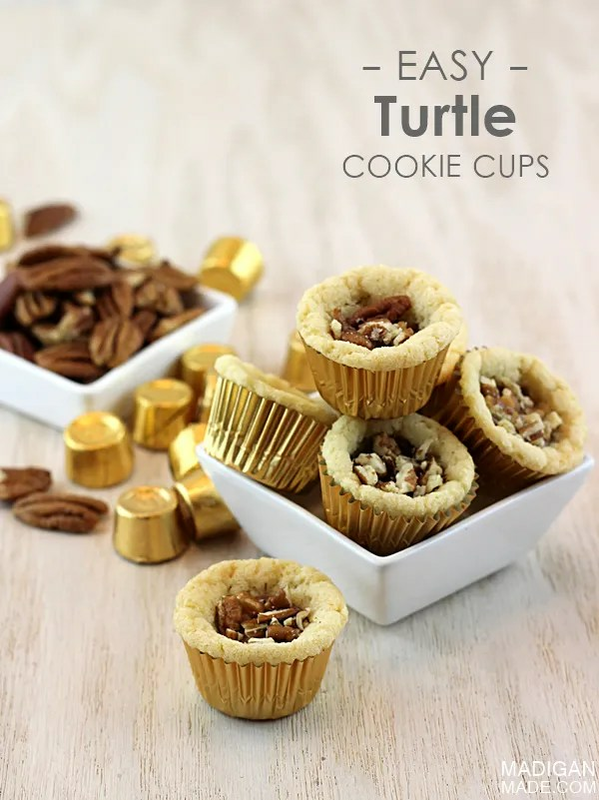 Well, this year I thought I’d try Rolos candies for another version of this easy cookie cup. This recipe would be a quick and easy cookie to bake this weekend in preparation for the holidays. If you didn’t want to use refrigerated cookie dough, you certainly could make your own from scratch… but I like my way. It’s easy! Break apart the cookie dough into 36 pieces. Roll each piece into a ball and roll in sugar. Place each ball into a lined mini muffin pan. Bake the cookies for about 6-8 minutes. 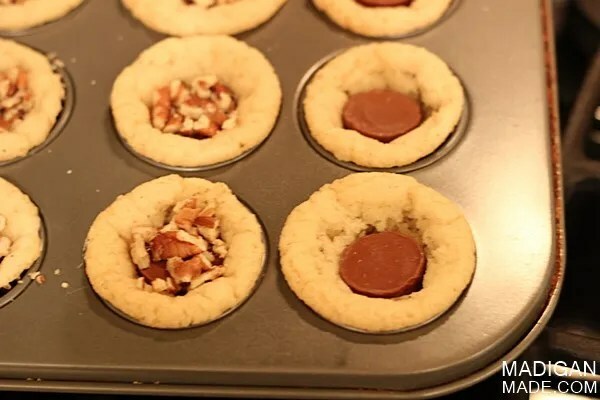 Pull the cookie tray out and press a caramel filled candy into each cookie. Place the tray of cookies back in the oven and cook for 1-3 more minutes or until the cookies are slightly golden on the edges. 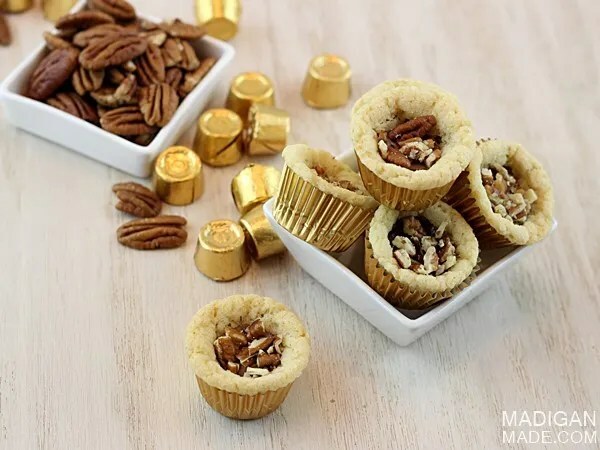 Remove the muffin tray from the oven and immediately sprinkle the chocolate candy centers with pecans. The candy center should be softened enough from being in the oven that the pecans should ‘stick’ to the chocolate. Allow the cookies to cool before attempting to remove them from the pans. TGIF! Have a wonderful (and hopefully crafty!) weekend my creative friends!